Flt.Lt. Shikha Pandey enjoys the pride of being the first and only IAF officer to play cricket for India. Her crisp sentences and no-nonsense attitude over the phone, left no doubt that this was a woman in uniform. But it takes a direct visit to witness the intensity that Flight Lieutenant Shikha Pandey of the Indian Air Force (IAF), possesses. Dressed in blue, there is no mistaking the determination in her eyes to serve the country as part of the forces and the uniform lends to this image. So, it was almost difficult to imagine that she adorns a different blue uniform as well to fight for the nation – one of a cricketer. Shikha is equally comfortable in her avatar as a bowling all-rounder in the Indian women’s national cricket team where she is the right-hand medium pace bowler and a lower order bat. Flt.Lt. Pandey enjoys the pride of being the first and only IAF officer to play cricket for India. While it is a big feat to even qualify to wear one blue, she is “blessed to don both the blue uniform and jersey for the country”. If one thought that these achievements are enough, it does not stop there. Pandey is also an electrical and electronics engineer, and an Air Traffic Controller in the IAF. She is also the first woman cricketer from Goa to play for India. She still however, has the unfulfilled wish of becoming an astronaut. But all this did not come easy to this unassuming 28-year-old. Daughter of a Hindi teacher in Kendriya Vidyalaya, she got to watch every single match with her cricket buff father. It was only a natural transition that she started playing regular cricket with the boys. The family from Uttar Pradesh moved to Goa on transfer when Shikha was eight years old and has lived there since. An avid student, she was also proficient in all forms of sport. Even though she was representing Goa in tournaments in the junior category in her higher secondary, she started professional coaching only in her second year of college in 2008. This was after she was asked by a chief woman selector of the Indian women’s cricket team whether she was serious about the game when she scored three half centuries for Goa. She was 19 then. Though she had the freedom to choose cricket over studies, she could not ignore the advice from her father that pursuing one’s passion should not be at the cost of education. This motivated her to remain an exemplary student all through, and compelled her to complete her engineering even though she had to take a 12-month break for her cricket commitments. After Goa, she went onto play for India A against England in 2010 and later against West Indies in 2011. She took a break from engineering in 2011 to train as she was one of the probables for team India, but could not make it to the team. She went back to completing her engineering, continued training and playing domestic cricket. In the final year of college Shikha took two major decisions. She turned down placements from three major multinational companies and sat for the Air Force Common Admission Test (AFCAT). 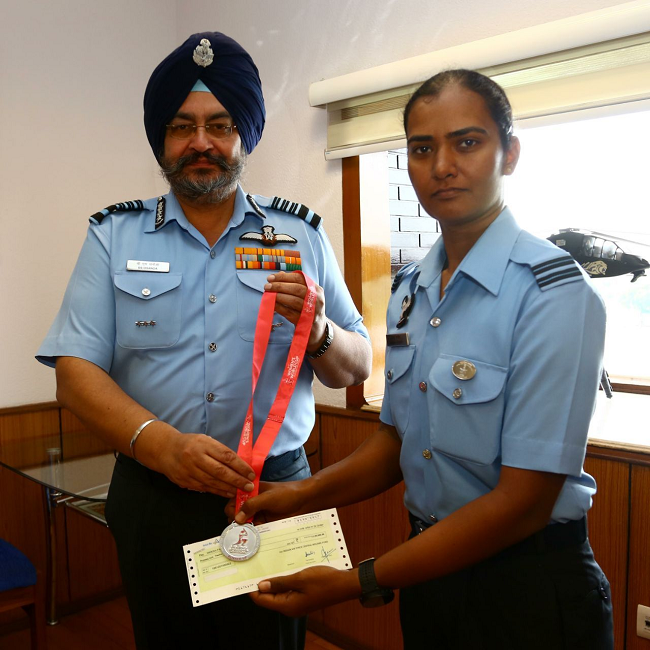 She sailed through the selection, completed her training as an IAF cadet and got commissioned as an officer. She chose IAF, not because of an assurance that she will be allowed to pursue cricket, but because she was interested in it. Though she mentioned in the selection interview that she was a strong probable for the Indian national cricket team, she was not hopeful about continuing cricket after becoming an officer. Nevertheless, after her commissioning she approached the Air Force Sports Control Board for permission to play. It was a first-of-its-kind request for the Board. Though there is an IAF men’s cricket team, Shikha was the first in the whole of the IAF to seek permission to play international cricket. The Board was very receptive, accepted her request, and Shikha, now as an officer, started practising, keeping her hopes of playing for India alive. Finally, her efforts paid off and she debuted for India in the T-20 match against Bangladesh in March 2014. The same year in July, she landed a berth to play her first ODI against Australia, and in August the first test series against England, where she held an unbeaten partnership of 68 runs with Mithali Raj. Her best and also as the only Indian woman in an ODI is her record of 59 not out and the three-wicket haul that she made against South Africa in 2014. Since then, Shikha has been a regular member of team India and has played two tests, 32 ODIs and 22 T-20 matches. And, her journey also includes the ICC Women’s World Cup (WWC) in July 2017 where India finished as the runner-up. The IAF recognised her for her performance in the WWC. On her return, Flt.Lt. Pandey was awarded the Chief of Air Staff commendation by Air Chief Marshal B.S. Dhanoa, Chief of Air Staff. Though the team did not bring home the cup, Shikha is happy that WWC has brought many positive changes to women sports in the country. 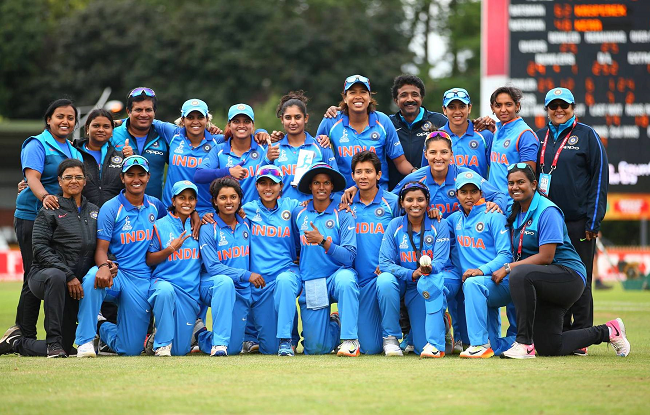 “Almost all the matches were televised and it made the whole country aware of the intent and extent of women’s cricket. It has been a major game changer and made people sit up and recognise us as players”. She says that women players should be given their due recognition, irrespective of whether they played, won or lost. This will encourage more girls to take up sport. After WWC many sports academies are seeing an increase in registration from girls for coaching. She sees things getting better in the future. Where does she see herself in the future ? “It is a huge thing to represent your country, both through the profession and passion. I will continue to work and play for my country as long as I am fit. It is a privilege to be playing alongside teammates like Mithali Raj and Jhulan Goswami,” says Shikha. Though the Air Force encourages Shikha to play for the country, it does not give her any special privileges. When she is not playing, she is just like any other officer discharging her regular duties. And, part of it is attending the requisite courses / training programmes like her peers that keep her equipped for her present duties and those that she might take up as she climbs the chain of command. And, that is how Flt.Lt. Shikha was in Coimbatore to undergo a course at the Air Force Administrative College. She was just like any other officer, attending classes, doing assignments, and taking part in evening sports. The only difference was that she would indulge kids who went to her for autographs. She humoured them not only with a nice wish and her signature but also chocolates.